The kettlebell is one of the most versatile yet simple tools in the gym. It’s essentially a weight with a handle that allows you to perform a nearly endless variety of compound exercises, giving you a high-intensity, full-body workout that builds lean muscle mass. The design of the kettlebell allows you to seamlessly transition from one position to the other without any discomfort or awkwardness, hence the term “kettlebell flow.” Kind of like a yoga flow, but with a lot more resistance. Plus, kettlebells let you get creative with your range of motion and movement patterns so that you develop strength in your underutilized supporting muscles. So here's your new go-to kettlebell workout that'll help you torch fat, tone muscle and build strength and mobility in areas you might be neglecting. Make sure to perform every exercise with quality form and focused intent to get the most out of every rep! 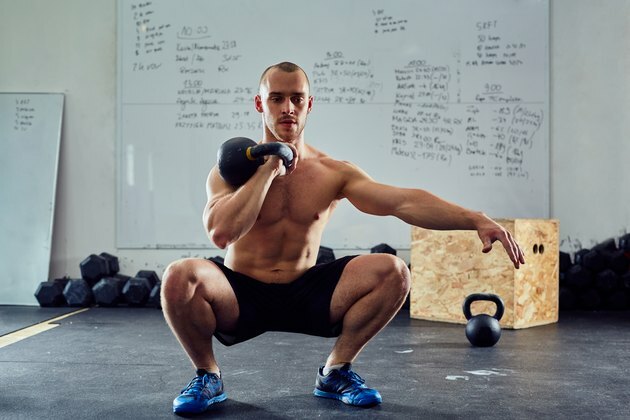 HOW TO DO IT: Start with the kettlebell in between your feet and underneath your hips and perform a deadlift with a powerful hip lockout at the top of the rep. Lower the kettlebell back down to the ground, and then hike the kettlebell back between your legs. Keep your core tight and spine long, as you swing the bell up to shoulder height. Allow the kettlebell to swing back to the starting position with control, and then repeat. HOW TO DO IT: Starting with a kettlebell on the floor, explosively clean the kettlebell up into your racked position. Squat down, keeping your chest proud, and then explosively press the kettlebell overhead. Keep a tight core with your ribs in. Switch sides and repeat. HOW TO DO IT: Hold a kettlebell upside down by the horns. Step back into a reverse lunge, stack your shoulders over your hips and your hips over your back knee. Tap your knee to the ground and stand back up. Circle (halo) the kettlebell around your head, rotating the kettlebell around your head from shoulder to shoulder. Keep a tight core and keep your shoulders away from your ears. Alternate sides. HOW TO DO IT: Start standing with your feet hip-width apart. Hinge at the hips, maintaining a long, neutral spine and a braced core. Grab the kettlebell with one hand and explosively pull the bell up into an overhead position, rotating it around your wrist. Make sure to use the power from your hips to help get the bell up. Slowly lower it back down to your racked position (hand at shoulder, bell facing out to the side), and then back down to the floor. Alternate sides. HOW TO DO IT: Starting with the kettlebell in between your heels, squat down and grab the kettlebell by the horns with your thumbs down. Perform a biceps curl in your squat, and then stand up as you lift the kettlebell behind your head to perform a single triceps extension. Bring the kettlebell back into your rack. Squat down and repeat. HOW TO DO IT: Start with the kettlebell in between your heels underneath your hips. Hinge your hips back with a long spine and grip the bell with both hands. Then jump as high as you can, keeping the bell at arm's length down in front of you. Land softly and load your next jump, fighting any jarring in your body on the way down. Repeat by loading, and then exploding. HOW TO DO IT: In a bent-over position, bring the kettlebell in between your heels. Row the kettlebell up toward one side of your body, keeping your elbows tight to your ribs and back toward your hips. Lower the kettlebell back toward the floor, and then explosively clean the kettlebell up into a racked position. Squat down, unravel the kettlebell back to the floor and repeat, alternating sides.